Camden, a small town in Knox County, Maine is my happy place. For the last four years we’ve staycationed in Camden for our November wedding anniversary. Camden in November is a very different place than Camden in say, July. As the temperatures drop and the tourists leave, the seasonal restaurants are shuttered for the winter. The year-round restaurants rely on the business of locals to make it through the cold winter. Last November we made the brisk walk from The Camden Harbor Inn (our favorite place to stay – and you MUST eat at Natalies while you’re there) arriving at Long Grain with red noses and stinging ears not once, but twice. Although it was a random Tuesday morning at the end of November, the small restaurant was packed (you MUST make a reservation!) and we were happy to slide onto the bar stools and sit elbow to elbow with locals slurping their noodles. Our first Long Grain experience was one of those quiet meals without much conversation because you’re too into the food, stopping occasionally to exchange delighted “I know, right!??! ?” glances with your dining partner. Since those memorable meals, I’ve been obsessively craving thinking about the bold flavors of Long Grain. Last week I convinced a bunch of friends that a four-hour-round-trip drive up to Camden to eat at Long Grain was a really smart idea. 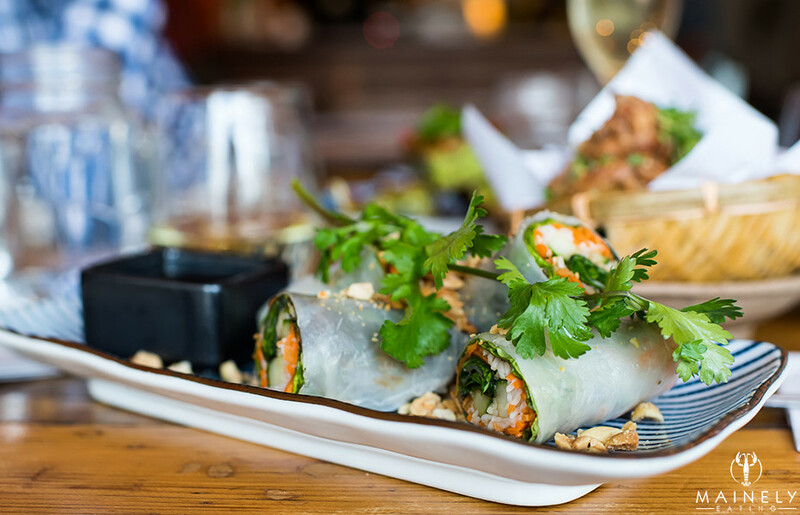 Once you’ve found the restaurant (there’s no signage), it’s time to make some tough decisions as you’ll likely want to order one of everything from the regular and daily special menu. 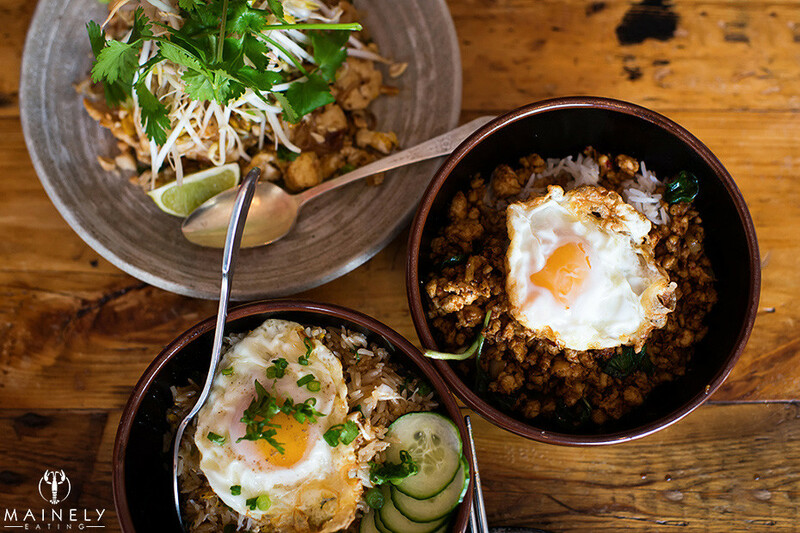 The husband and wife owners Ravin Nakjareon (a two-time James Beard semifinalist) and Paula Palakawong hail from Bangkok and their Thai food occasionally hints at Japanese, Korean and Vietnamese influence with ramen, kimchi and Vietnamese noodles on the menu. 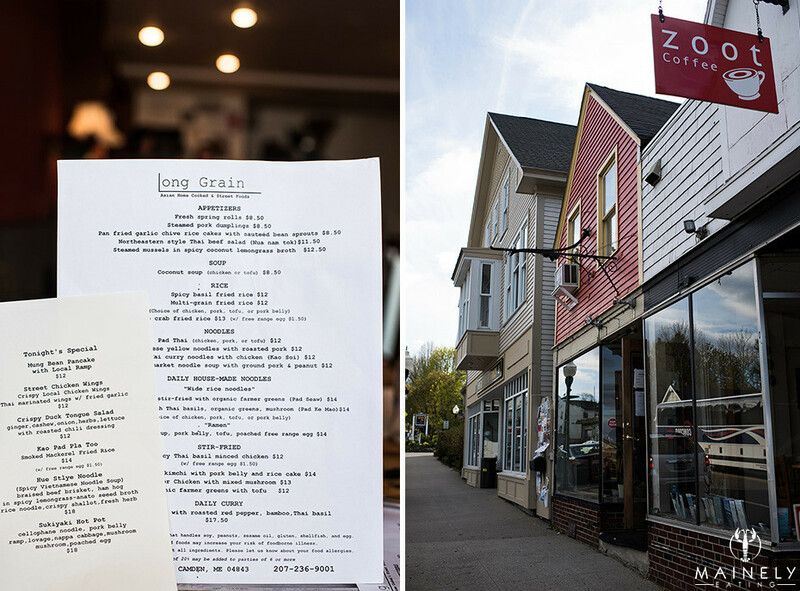 Seasonal Maine ingredients also play a key role at this restaurant – local ramps, plump Maine mussels and more. We ordered a bunch of appetizers starting with pan-fried garlic chive rice cakes. 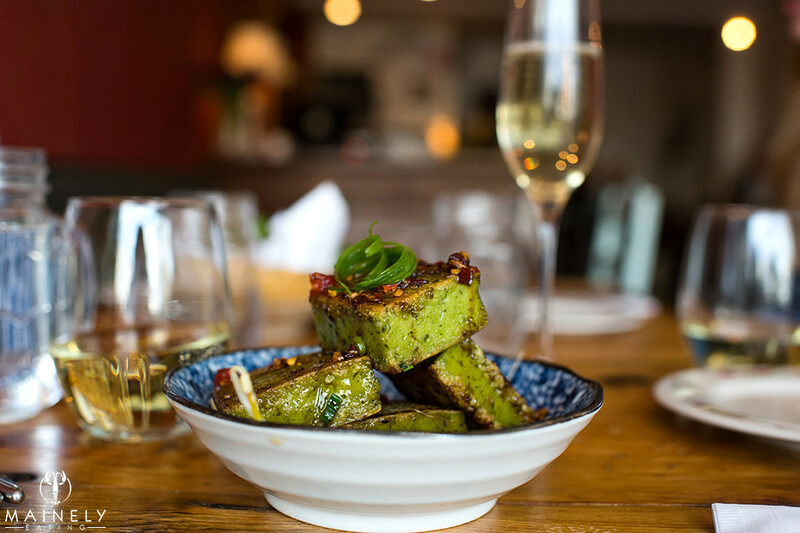 The green-hued slabs were perfumed with the spring flavors of chive and garlic. Sauteed beansprouts floating in the savory sauce added a welcome crunch. 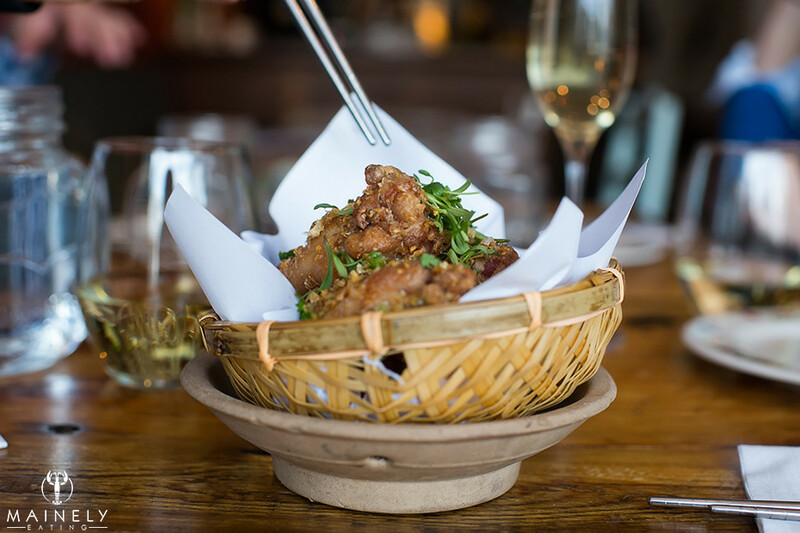 Street chicken wings with crisp fried garlic from the specials menu were succulent and crunchy. Cliché of course but they really were definitely finger lickin’ good. The wings were accompanied by a little bowl of potent sauce that was fiery with just enough acid to cut through the deep fried taste. 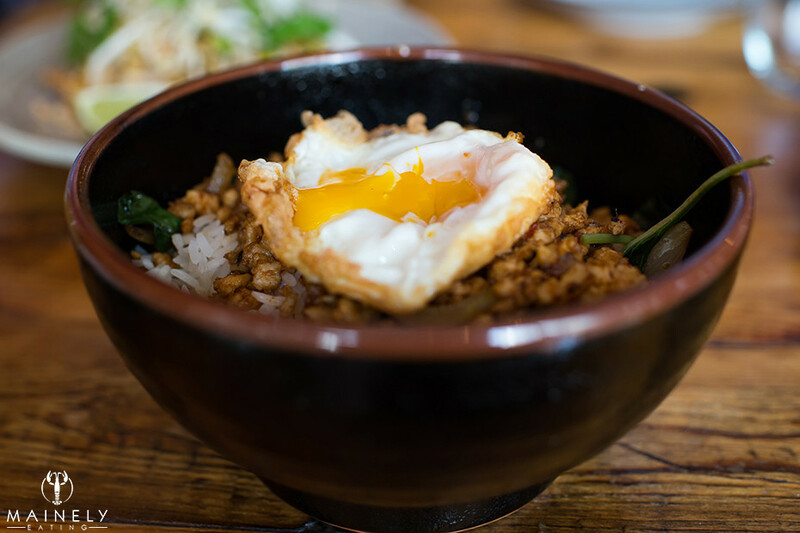 Spicy Thai basil minced chicken topped a bowl of snowy white rice and the (optional) warm runny egg yolk brought everything together. The chicken was crazy tender and so full of flavor. I’m sure everyone has experienced takeout pad Thai, it’s often greasy with clumped-together noodles. That’s doing a disservice to pad Thai. 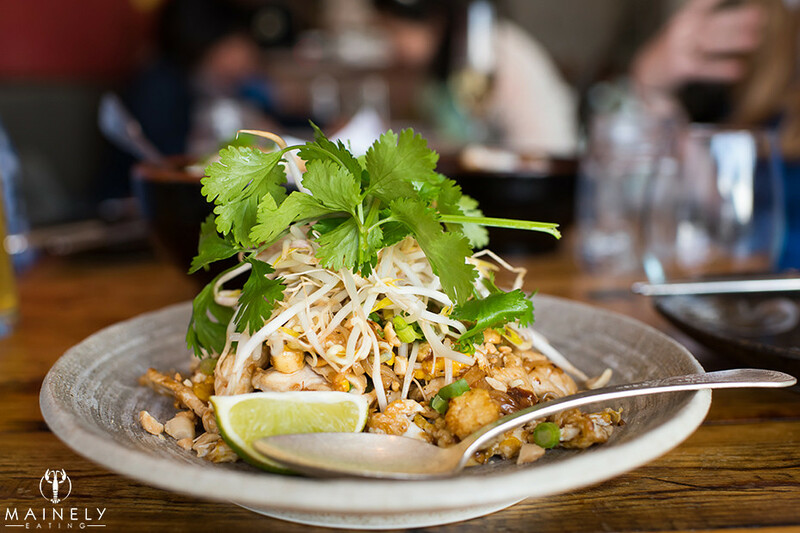 Long Grain pad Thai is light years from your previous takeout experience. Slippery house-made noodles are toothsome, full of flavor and not at all greasy. In fact, you’d be wise to order extra to-go because you won’t have any leftovers. The standout dish for me was Maine crab fried rice. 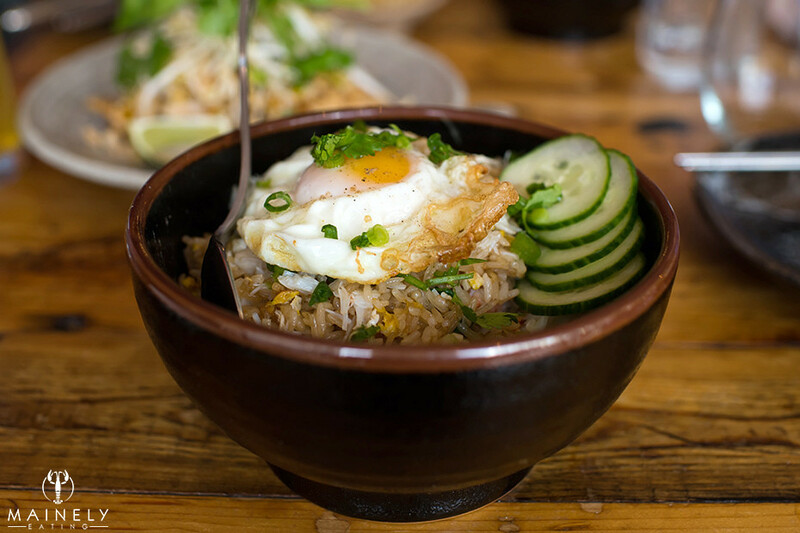 Gratifying chunks of sweet crab meat were generously dispersed throughout the decadent fried rice. You can choose to put an egg on top, and why wouldn’t you? After much deliberation and chewing, one of my dining companions announced, “This rice is somehow…gentle” which sounds strange but was weirdly accurate. Cooling cucumber and a sweet crunch of onion added an extra dimension. 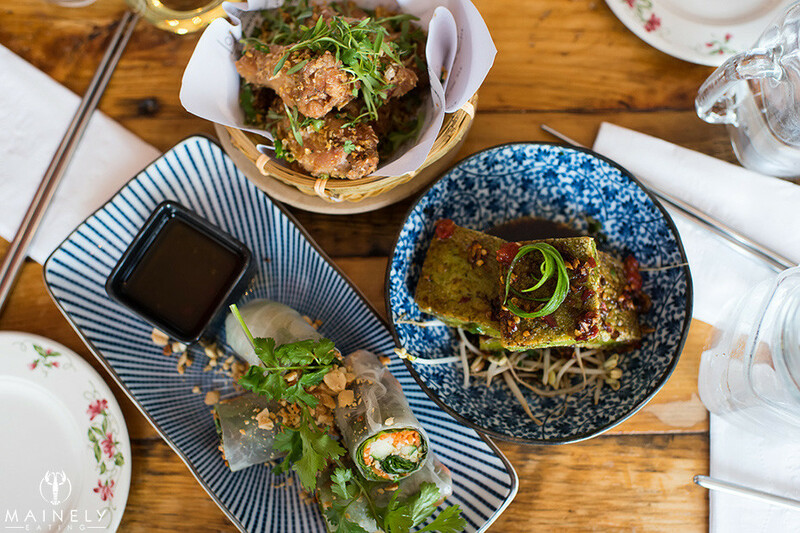 Portions are generous and most appetizers can easily be shared. Don’t miss out on the thoughtful sauces that accompany each appetizer. The room is fairly sparsely decorated, it’s almost like you’ve been invited into someone’s living room and they’ve borrowed a bunch of chairs from relatives. It will be interesting to see if the decor changes with the imminent move to a new larger space with attached Asian market. There are maybe 6 or 7 bar stools at the bar and 7-8 tables for 2-4 people (tables can be pushed together for larger groups). It’s ALWAYS wise to make a reservation even in the winter. It can be tough to get through on the phone to make a reservation (the answer machine messages instructs you not to leave any messages but just to call back) and you should also be prepared to be told that your table is reserved for another customer 90 minutes after you sit down (this is not a place to linger over a 3 hour dinner) but it’s worth it for the food. The atmosphere was lively with conversation and music. Is it a place for a romantic first date? No, probably not. But that’s because you’d want to wait until maybe date #5 when you’ve dropped the whole “nibbling on a salad” polite act and can slurp your noodles and lick the garlic-y chicken wing sauce that’s dribbling down your wrist. How to serve and eat caviar. I just ate the best tacos EVER and that’s not hyperbole. More in stories. Go eat at @bartacolife in the Seaport, if you don’t get at least one crispy pork belly 🌮 we’re not friends anymore. With so many new spots opening in @seaportbos it’s easy to forget @envoyboston they do such a great brunch! Plus live music by the awesome @pbandjayrecords 🎵 Here’s a delicious #dutchbaby with #grandmarnier sauce and whipped mascapone. Notification of new posts by email?